Altmetrics help authors see the impact of their papers, books, and datasets by tracking references across social media sites, newspapers, government policy documents, and other sources that mention scholarly articles. An Altmetric score is generated from these mentions and is derived from three main factors: volume, sources, and author of each mention (The Altmetric Badges, 2015). 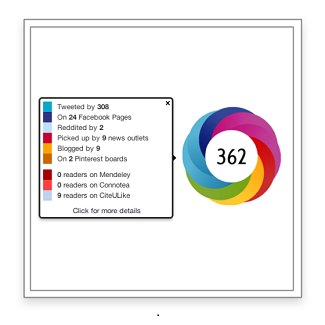 Learn more about the Altmetric scoring system here. We are pleased to be working with Altmetric to provide this information for the benefit of researchers. Scholarly articles in ProQuest with Altmetric scores can be easily identified by the Altmetric badge in the article’s abstract view. When a researcher clicks on the badge they will be taken to a landing page, which provides additional article-level metrics and details. Since article-level metrics were developed in response to the scientific community’s desire to get a more granular level of a paper’s impact on research, users will find that most articles with an Altmetric score and badge are in the areas of science, technology, and medicine (Article Level Metrics, 2015). Further, these will generally only be available for individual articles published from 2011 onwards and include a digital object identifier (DOI®) within the ProQuest record. Need help or have questions? Please contact ProQuest Technical Support.